Forums » General Discussion » Advice from Axiom Owners » What Do You Think? #406131 - 07/14/14 03:58 AM What Do You Think? I listen to classical music on 2.1 system. My sub is circa 1979 and needs replacing. So I am thinking of trading my M80v3's (I could use more bass and they are in excellent condition) for 2 M22v4's and the EP500v4. I have no LFE outlet on my present stereo amp (circa 1988). Can I still connect the sub to my amp? Would my system's performance be improved? Your advice is appreciated. 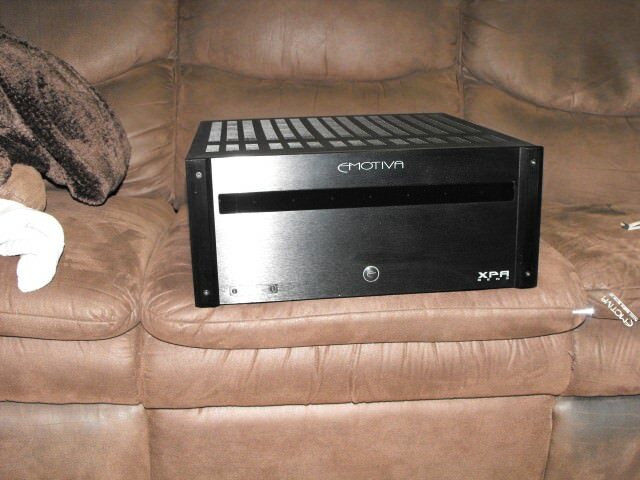 Get a new 2-channel amp, ditch everything (no sub) and get M100's. I just upgraded M60's to the 100's. I got a 500 when I got the 60's 4+ years ago. The M100's don't need the sub for music, not for me, anyway. I know the M80's fairly well, as a member here is also a neighbor of mine. My 100's are the first speakers I have ever owned that finally make classical music sound like the entire orchestra actually showed up and EVERYONE played. The dynamic range is amazing and, at last, someone can flesh out all that stuff from the murky depths and bring it a clarity that I have never heard (read: could afford). They are a stupid silly bargain from some really smart peeps. You are THE listener the 100's and 1100's were made for----2 channel old-school people. You'd probably love the 1100's, but the whole set-up is a lot more money for them and their electronics. Another bargain, but in a different league. Thanks for making me want another something, Bob. Jerk. I will agree with bob. I did start off with a set of M80v4, and they were fantastic. I did get suckered into the belief that there was not enough bass out of the M80.. (but I was probably fooling myself). I traded them back to Axiom (in the 30 days) and went with the LFR1100, and the full orchestra is there. But I think that you will be fooling yourself in thinking that you need a whole load of bass. I guess it depends on what sort of music you are listening to. If you do get a sub then yes by all means you can crank up that sub amp to give you more sonic thump, but it will be at the cost of loosing detail in the mids as it will get lost in the thump. Not much sort of a pipe organ really gives that sonic residence that needs a sub. Your M80 should be able to get down into that 29~35hz range that most music doesn't get blow on a good day. I will say however that the LFR1100 do sound very sweet and fill the room to the point you are no longer listening to music, rather experiencing it. The biggest detriment to bass is the room itself. Cancelation is the issue and there are a few ways to help correct it. You can use treatments like bass traps or you can correct it electronically with something like an Antimode which is self contained and does wonders or move up to a Minidsp and use room correction software. I have lived in enough houses (same speakers for 30yrs) over the years that it eventually became apparent that not all rooms favor your speakers. Subs are handy in the respect that you can move them around and if you use 2 you can fill the nulls if you have room to move them. I did not realize how drastic this was until I added a antimode to my 2 channel system. And Matt has generously offered a zero-interest, 5-year loan program (on him) for those wishing to upgrade to 100's or 1100's! What a guy! Lee, as you know, my own listening is almost entirely classical and I've suggested that 2-channel source material is heard significantly more realistically with surround speakers in use driven by an AV receiver using a mode such as DPLII. Having said that, if you're going to continue using only front speakers, then my view is that using M22s plus an EP500(or similar), which is what I use, will give you a significant advantage in bass extension(especially relevant in pipe organ material)over even speakers such as the M80s and M100s which have relatively good bass response when used alone. So, I'd be in agreement with the trade that you propose. As to connections, if you continue to use the stereo amp which has no provision for bass management, the sub would be connected to the output terminals in parallel with the M22s. The M22s would be driven full-range and the low-pass filter in the sub would be used to roll it off above the point(say about 60Hz)where the M22s roll off "naturally". If you stay 2.1, then outlaw has a cool stereo receiver with bass management. Looks weird. In my music only tube driven system, I use M2s each with its own little monster EP400 sub. M22s would be great also. I employ the Speaker Level inputs into each EP400 from the amp's Speaker Out terminals - this gives true 2 Channel Stereo (2.2?). I think the best choice for me is to trade in the M80v3's for an EP500v4, and purchase two M22v4's through the factory outlet. John, thank you for your comments. I do want a surround system (4.1). I think I would like the ambient qualities it provides and I do have several SACD's. For the rest of my collection I can use the DPLII mode when I purchase a new receiver with that or a similar mode. Occasionally I watch a movie but do not enjoy all the effects (I wear ear plugs when going to the movie theater to preserve my hearing!). Orchestral music is another genre where occasional loud perorations and grand finales do not bother me but rather have a stirring effect and are not artificially produced or enhanced as they are in movies. Tam, I thought about the EP400 and it may very well work for me, but I think the extra power and abilities of just one 500 would be a better bet since occasionally deep low's can be better heard when listening to organ music. I am not interested in pressurizing my room nor do I have too much concern for smoothing out the bass throughout the listening area. Bob & Matt, one of the reasons I want to change my setup configuration is because of the large monoliths I have in the M80's that dominate the front of my area. Purchasing M100's would be overkill for me in terms of their presence in my listening area and I believe I would have more control and flexibility of the bass at lower listening levels with a satellite configuration. So with this change I am considering, I will not be as picky with the purchase of a new receiver since I will not have the 4 ohm issue. I would also like some advice regarding the model of the surround speakers that would be best. For now I have some floor standing celestion speakers that may suffice temporarily. Thanks again everyone!